In a medium mixing bowl, stir together strawberries and, if desired, the granulated sugar. Set aside. 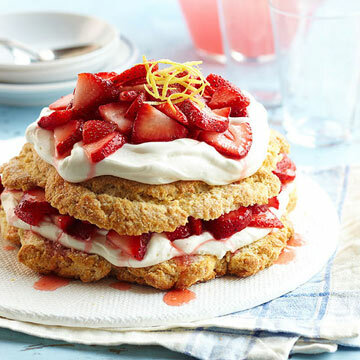 For the shortcake: In a medium mixing bowl, combine the flour, baking powder, cream of tartar, baking soda and salt. Cut in the butter until mixture resembles coarse crumbs. Make a well in the center; add the buttermilk, lemonade concentrate and the 1/2 teaspoon lemon zest all at once. Stir just until dough clings together. On a lightly floured surface, knead dough gently for 10 to 12 strokes. Pat dough into an 8-inch circle on a baking sheet lined with parchment paper. Bake in a 400 degrees oven for 16 to 18 minutes or until golden. Cool slightly. Meanwhile, for Lemon Mascarpone Cream: In a medium mixing bowl beat the whipping cream with an electric mixer on low speed just until soft peaks form. Add the mascarpone cheese, powdered sugar and 1 teaspoon lemon zest; beat until fluffy (mixture will thicken as it is beaten). Using a large serrated knife, gently split warm shortcake horizontally into 2 layers. Using a wide spatula to help support the layers as you move them, place bottom layer on serving platter. Spread with about two-thirds of the mascarpone cheese mixture. Spoon some of the strawberries onto mascarpone cheese layer. Again using a spatula to help support the layer, add shortcake top. Spread with the remaining mascarpone cheese mixture and top with more of the strawberries. Sprinkle top with additional lemon zest, if desired. Pass any remaining strawberries. Serve immediately, cutting into wedges and passing any remaining strawberries. * Place 1 1/2 teaspoons lemon juice or vinegar in a 1-cup measure; add enough milk to make 1/2 cup. Let stand 5 minutes before using.